This clip was mailed to Gakwer by Walter Isaacson himself, the author of Jobs biography. How did you lost your soul? WTH. did you even read the article? I like Sony products. They make the best streaming box out there. I respect the thoughts of Great man “Steve Jobs”..
Steve lost 20 Kilo in the last few years. Nice myth. omg thats the dumbest s*** I’ve ever read. I don’t believe that. I believe he was a great figure in consumer technology but a not a great fashionista. @omg . . where in this story do you get the crazy idea that his simple outfit was an attempt to be a “fashionista” of ANY level?? You’ve managed to completely miss the point of this story. You’re entitled to believe anything you want (another example of why belief is such a worthless thing) but if you are going to pollute cyberspace with your oh so important beliefs can you at least try to make them more relevant to whatever it is you are commenting on? Thank you. P.S. – free tip: beginning any communique with hyperbole isn’t the best way to be taken seriously. @omg People like you could be either dense, or plain stupid. I also wear the same (well nearly the same) clothes, day after day. Yet my career has not been nearly as successful as Steve’s. Maybe if I also get about 100 identical tee shirts (personal signature style) and identical beige pants (another signature of mine) I will reach his level, hopefully soon. This is Steve Jobs’ biggest mistake. Always having black next to his skin – it is the main reason to his cancer. It created disorder to skin and especially to his tissues and organs inside black turtleneck. I’ve worn black mock turtlenecks for more years than Steve, as (1) it can be worn with ANYTHING, (2) black always hides a multitude of sins, and (3) there’s no decision-making involved. Jeans or suit pants, it just works. I always enjoyed seeing him as casual but distinctive — especially since I was only 4 years older than he and felt that way whenever I wore them. It was a great look — and still is for some of us. His distinctiveness will be missed in all his unique ways. 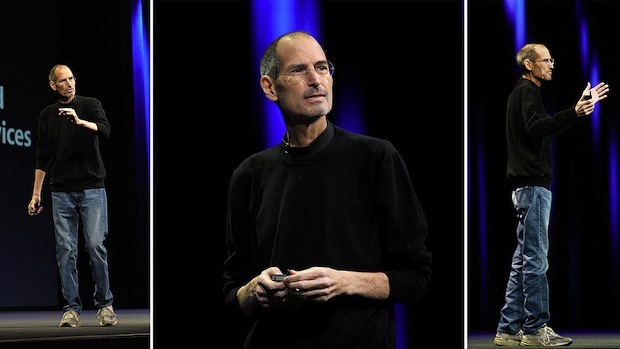 Steve used to wear different kinds of clothing in his earlier days at apple. He even did some of the corporate suit looks, but his hatred for corporate culture had a lot to do with him ditching the suit and tie, as well as shutting down Apple’s board rooms that Amelio and Scully built. It has somthing to do with the illuminati. i know your reading this i know you are!!!!! trying to scroll down so you dont read it? So dirty looking tennis shoes complete his signature style of garb for work? “Fascinating story”? Really? Ummm yeah.